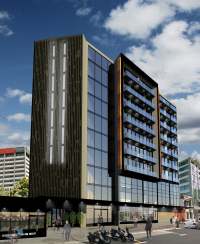 A new nine-storey boutique hotel and quality apartment complex is to be built on the corner of Kate Sheppard Place and Lambton Quay in Wellington, by Fletcher Building. The hotel and carparks will occupy the basement and first three floors with apartments on the next six levels. The five-star hotel will have 45 rooms, a café and bar, and be Wellington’s first boutique hotel to be operated under the NZBH brand. Apart from the penthouses, the apartments on the other floors will all have two bedrooms and a very high standard of fittings and fixtures. The complex, to be known as ‘Lambton on Waititi’ has been designed by Angela Foster, a principal of Wellington specialist hotel and apartment architectural practice Foster + Melville. The property is being developed by Equinox Group (Equinox) in a joint venture with the Wellington Tenths Trust. Equinox is an urban residential developer. They recently completed the White Heron Apartments in Parnell, Auckland and are currently working on a boutique market village in Auckland’s Orakei Basin and the construction of some 400 homes in South Auckland. The complex is being marketed by Tommy’s Real Estate (Tommy’s) who have a display unit on site and who report strong interest in the apartments. Tommy’s says that the lower level apartments provide an ideal Wellington base for people who work in the city and have a house in the Wairarapa or on the Kapiti Coast being adjacent to the railway station and within the CBD. The higher level apartments, with extensive views over the harbour and Parliament, appeal to owner-occupiers who want a quality Wellington apartment in a quieter location than being next to the entertainment centre or Oriental Bay. Interest in the apartments has been very strong resulting in around 25% going under contract to date, since they were first released three weeks ago. This is the second joint venture between Equinox and the Wellington Tenths Trust. The first involved the successful development of Pipitea House in neighbouring Pipitea Street, a nine-storey office building occupied by the Department of Prime Minister and Cabinet and the Government Communications Security Bureau. The apartments which are priced from $620,000 can be secured by a 10% deposit payable on signing up and require only a 20% for lending as LVR’s don’t apply to new builds such as this development. Original generation time 1.5990 seconds. Cache Loaded in: 0.0145 seconds.